Following a catastrophic flood in May 2010, the Commerce Department’s Economic Development Administration (EDA) invested $2.5 million in the EC in 2011 to renovate an historic building, the Trolley Barn, which tripled the facility’s capacity. 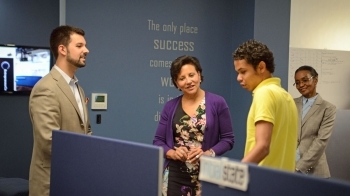 The investment is also helping mitigate economic impacts of future disasters and helping build a stronger, more disaster-resilient economy.While at the EC, Secretary Pritzker toured the facilities with its president and CEO Dr. Michael Burcham and met with facility staff and entrepreneurs, including many young entrepreneurs working in a wide variety of fields. For example, Nashville Grown is a company that aggregates and distributes produce on behalf of local growers, enabling their products to compete with conventional distributors and reach nearby restaurants, schools, and stores. She also met the team working on dVisit, a mobile and web app that enables patients to be treated for routine care by their family doctor, and InvisionHeart, a secure hardware and software system that allows for the capture and review of cardiac data and serves hospital clinics and ambulatory care. The entrepreneurs who started the companies all talked about how the Entrepreneur Center provided tremendous resources to help them take their ideas and concepts to the next level. Secretary Pritzker talked with them about the administration’s strong support for public-private partnerships like the EC, which are an integral part of the ecosystem that supports business start-ups and job growth. The secretary was also joined by the team from Commerce’s Minority Business Development Agency’s (MBDA) regional office in Memphis, and encouraged collaboration between MBDA and the entrepreneurs who work with the center. MBDA’s offices provide resources to minority-owned businesses to help them gain access to contracts, capital and new markets in order to grow and create jobs.